Darwin doubters have sometimes questioned evolutionary theory by asserting that no “missing link” exists between humans and other primates. But the fossil record shows that there was no instant leap to humanity: rather our species’ physical hallmarks appeared gradually over the past several million years. “Humans did not suddenly come into existence, but we share features with many other [species],” John G. Fleagle, an anatomist at Stony Brook University, has said. Fingernails evolved 54 million years ago (mya) and the opposable thumb 25 mya, for instance. The pelvis shape needed for walking upright as well as the knee appeared more than 3.5 mya, and the foot arch arose around 1.8 mya. Although skull construction was set around 35 mya, brains only ballooned in size between 2 and 1 mya, and the chin dates from around 200,000 years ago. With apologies to Shakespeare’s Hamlet: what a patchwork is a man. One feature that visibly separates us from most other mammals is our lack of fur. As Nina G. Jablonski explains in our cover story, “The Naked Truth,” the transition of hirsute to hairless helped to set the stage for the emergence of large brains and symbolic thought. The appearance of bare skin was one of a suite of adaptations that allowed our ancestors to thrive on the savanna as grasslands expanded in Africa starting about three million years ago. Our forebears abandoned their easier foraging habits, traveling longer distances through a tropical landscape to acquire sufficient food to survive. Adding meat to their diets meant more calories, but finding prey also took more work. Their activity level increased and with it their need to dissipate body heat to avoid tissue damage. By 1.6 mya, protohumans had long legs for sustained walking and running. Along with that trait came naked skin and a large number of eccrine sweat glands, which produce moisture that removes body heat through evaporative cooling. The hairs on our head also help to combat overheating, by shielding our big brain from direct sun. Although the board of editors didn’t plan it this way, many of the other feature articles in this issue also examine changes over time. The connection is most direct in “The Art of Bacterial Warfare,” by B. Brett Finlay, which describes the ancient battle between infectious agents and their human hosts. But other articles also describe “evolution” in various areas. Whereas Finlay’s article focuses on inner space, for instance, “Cloudy with a Chance of Stars,” by Erick T. Young, looks at outer: how stars arise and change over time, a seemingly simple question that has long puzzled astronomers. “The Prolific Afterlife of Whales,” by Crispin T. S. Little, explores how sunken whale carcasses today—and dinosaurs millions of years ago—support a series of ecosystem oases on the seafloor. Even “Better Mileage Now,” by Ben Knight, looks at how internal-combustion engines are changing, creating improved performance. 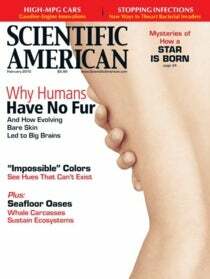 By explaining such advances, Scientific American strives to fulfill its mission of demystifying a changing world.